The Saville Life: Friday Favorites--We're Having A Baby!!! Friday Favorites--We're Having A Baby!!! So, I've been sort of silent on the blog front because I just couldn't write about anything without hinting at the above! I have just been so excited! We had our first ultrasound picture yesterday and I couldn't wait to share it with you because the fact that WE ARE HAVING A BABY is DEFINITELY my MOST FAVORITE OF ALL TIME! So--on February 12, I woke up feeling a little icky and just a tad bit suspicious! And THIS HAPPENED! (Talk about candid lol!) Being real with my people is my FAVORITE! We told both sets of our parents and waited patiently. Since we had a history of miscarriage, we spent some time doing blood work about two weeks in. Then, we had an ultrasound two weeks ago. Finally, we had an ultrasound yesterday that confirmed everything is where it is supposed to be and doing what it is supposed to be doing! 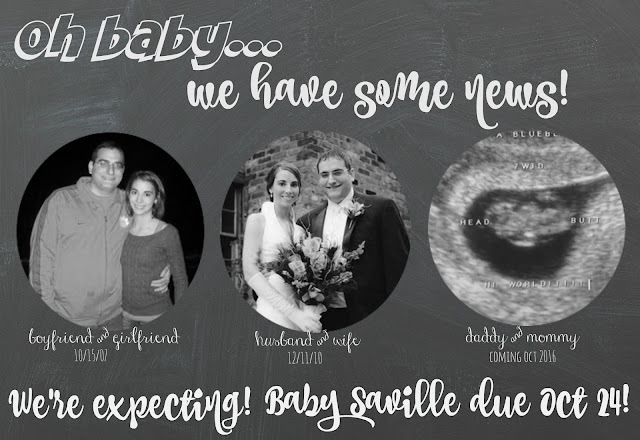 We are so insanely excited and so grateful that God has blessed us with Baby Saville. We couldn't have gotten to where we are without your prayers and we covet your continued prayers throughout the pregnancy! Hello World! This little boy or girl is my absolute new FAVORITE! I am so happy for you! I've been praying!